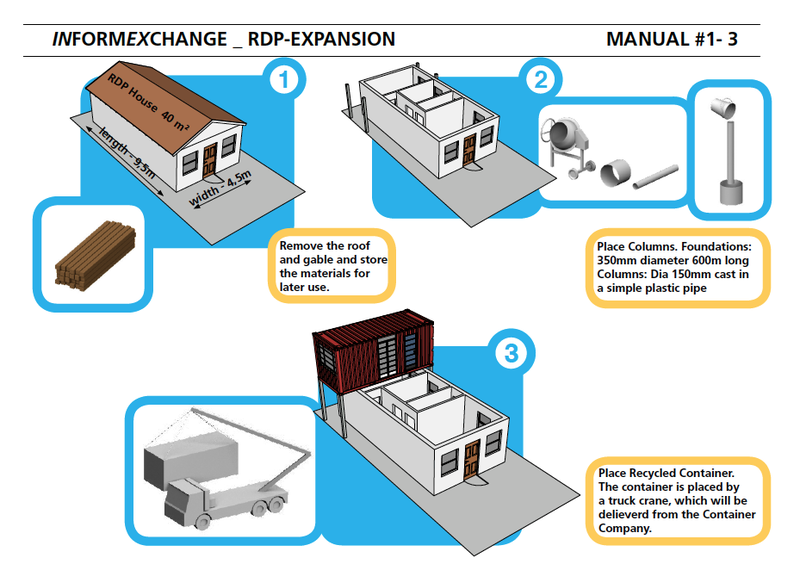 More and more people living in RDP houses are seeking new ways to earn an income from their properties. informexchange will help them do exactly that. 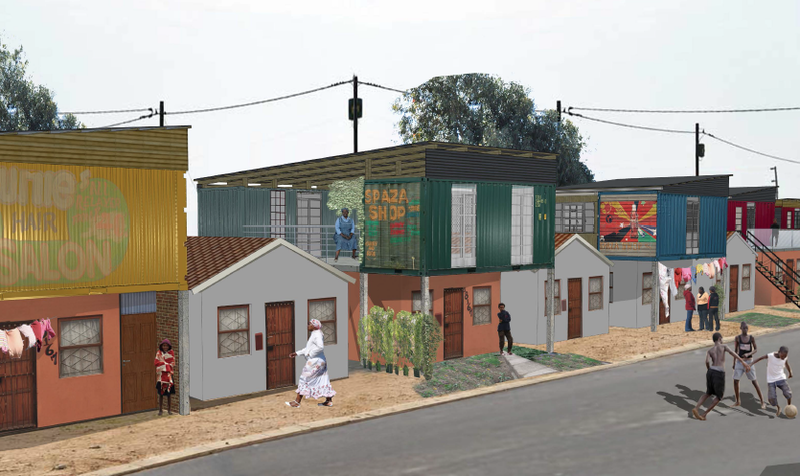 Over the last 20 years, South Africa’s RDP housing programme has built more than 3 million RDP homes for households living on low incomes. Evidence indicates that many of the people who have benefited from the programme have enjoyed a significant rise in their standard of living. But experience also indicates that the same people still face a range of legal and practical obstacles when it comes to earning an income from RDP homes. 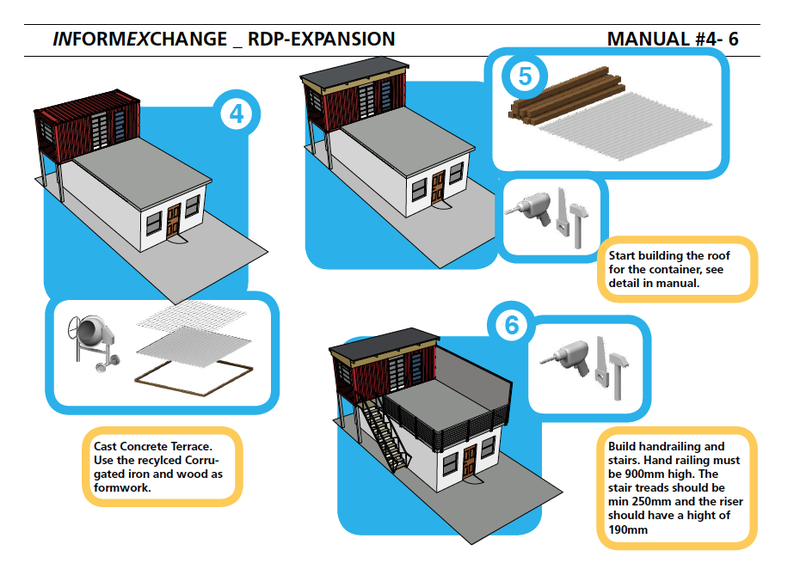 Image: The informexchange RDP-expansion render. Under the slogan ‘This House Works For You!’ informexchange is an innovative solution that is specifically designed to guide RDP households towards earning vital income from their homes by, for example, using them as the base for a small business or renting out rooms. With a strong focus on collaborating with the target communities and encouraging them to contribute their ideas, informexchange will initiate, moderate and accompany the interactive planning process from start to finish in partnership with various non-governmental organisations (NGOs). Together, they will help to boost economic development in low-income communities by triggering an exchange of information and knowledge between all those involved. Having undertaken extensive research among the residents of the Better Life RDP community in Philippi, Cape Town, Kim is confident that informexchange is capable of meeting the specific and unique challenges facing South Africa’s low-income citizens. “Our visits to Better Life taught us a number of important lessons,” recalls Kim. “For example, while moving from a shack to a house was very important to RDP households, they complained about the limited scope for expanding their new homes. In addition, the new settlement offered very little in the way of formal infrastructure to support a small business. Most people still had to travel 20km and more to their job. 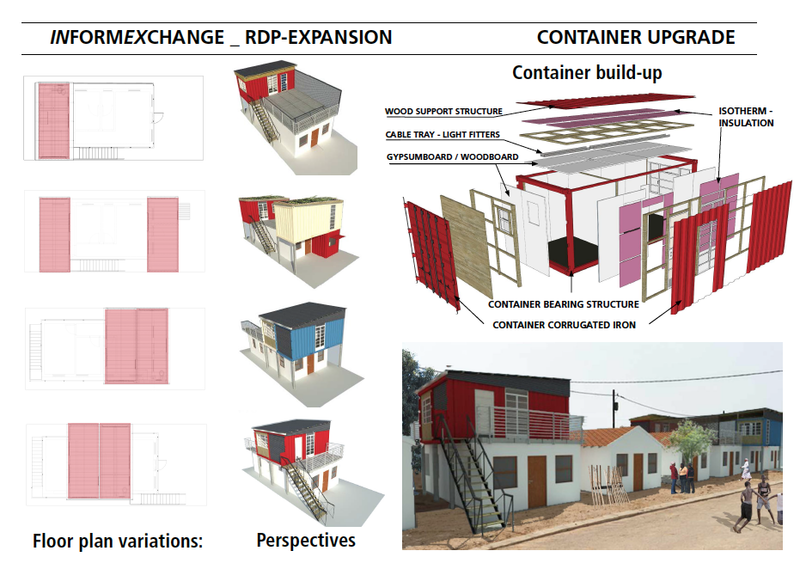 Participation in the design process informexchange offers a basic, scaleable design template that can be adjusted to an individual household’s needs and budgets. Using recycled and/or offcut building materials (such as containers, wood, windows, doors, steel, etc. – depending on availability) is a fundamental part of the design and an important factor in reducing project costs. Participation in the building process The design is based on DIY methods, with local material sellers and craft workshops acting as an integral part of the process. Training programmes will enable the house owner and local craftsmen to learn new construction techniques. This, in turn, allows a mutually beneficial technology transfer among community members while ensuring the expanded homes will be maintained. Consultancy informexchange has a network of NGOs working on a financing model to reimburse the costs of investment. This will involve supporting high-potential business ideas through a well thought-out business rationale.